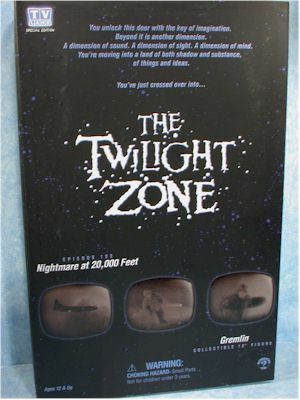 Yes, I just reviewed the Kanamit from Sideshow Toy Twilight Zone series. Whe didn't I review these together? Because they were distinctly different enough that I wanted to separate them out. I said that the episode with the Kanamit, To Serve Man, was perhaps the best known TZ episode. The reason for the 'perhaps' was that there are at least two others that could contend for that title - The Monsters Are On Maple Street, and the episode the Gremlin is from, Nightmare at 20,000 Feet. In this episode, the already unstable William Shatner is pushed over the edge by his vision of a 'gremlin' destroying the engines on the wing of the plane. Of course, he wasn't as crazy as everyone thought. 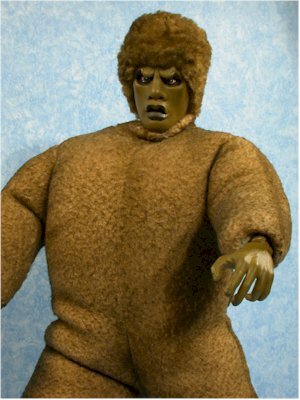 This monster isn't only one of the most famous TZ bears, he's also one of the absolute goofiest. That's not the fault of the toy, but the source material itself. 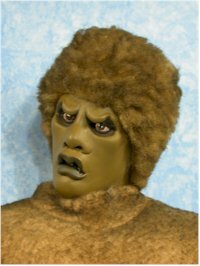 Other Twilight Zone figures that Sideshow have out or coming up include the Kanamit from To Serve Man (reviewed here), the Invader from The Invaders, and the Doctor and Nurse from Eye of the Beholder (reviewed here). 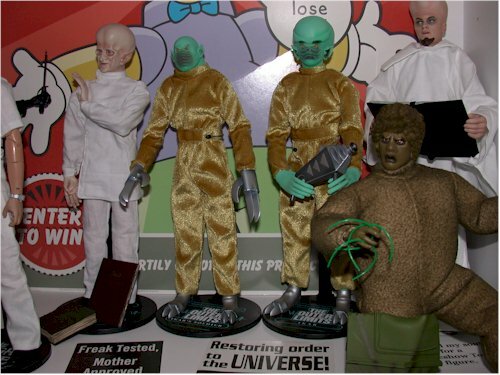 Other Outer Limits figures include the Helosian from O.B.I.T., Andro from the Man Who Was Never Born, the Zanti Misfits, Gwyllum from the Sixth Finger (reviewed here), the Ebonite Interrogator (reviewed here), and Ikar and his Soldier (reviewed here). I have the exact same things to say about this packaging as the Kanamit - excellent graphics right from the episode, and marvelous text that gives you a synopsis of the overall show, the specific episode, and even a complete cast list. It also has the same negative, with the action figure stand attached to the cardboard insert. While you never get a really good look at the gremlin's face in the show, even when he's right up against the window, this sculpt is extremely accurate. Comparing it to the still photos shows off the accuracy and detail. The hand sculpts are also good, and I think (although I didn't check every Sideshow figure) that they are new. The hand sculpt matches up with the ripping, pulling, tearing up the wing look you'd expect. I have a mixed feeling on the paint ops with this set, although it's predominately because of the outfit. The paint ops on the face is excellent, with great detail. The eyes are perfect, and the lip line clean and straight. 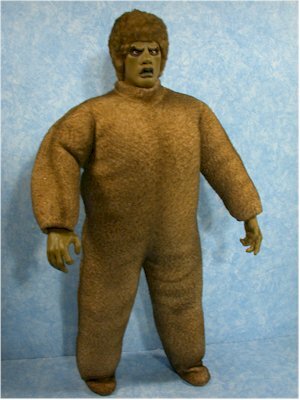 Another plus is that the skin color of the hands, face, 'hair' and body suit match extremely well. My only negative is that the paint spray used on the cloth outfit leaves him with an odd, chemical feel when you handle him. The Gremlin has the same standard Sideshow body. He has the ball jointed neck, ball jointed shoulders, cut biceps, double jointed elbows, the special Sideshow wrists, jointed chest and waist, ball jointed hips, cut thighs, double jointed knees and ankles. The extremely padded body suit tends to reduce the usefulness of some of this articulation, particularly in the torso, but he's still better able to take and hold poses than I had anticipated. The outfit is a bit disappointing for me. 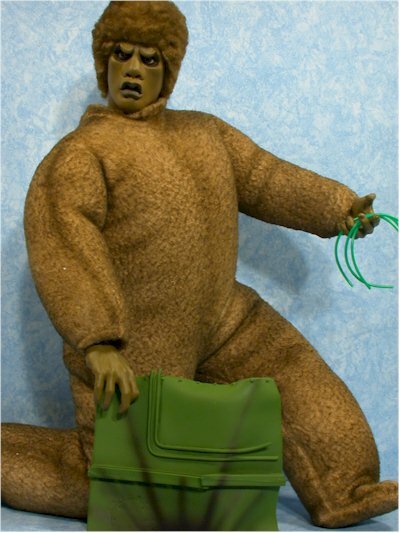 It's not because it's goofy - the character was as goofy as you can get - but because it doesn't match the source material as well as some of the other TZ figures from Sideshow. The bodysuit is so heavily padded, he looks like a parade balloon. But that's not even my biggest complaint. The area that the suit doesn't match the original is in the knap. The actual suit had a fairly heavy knap, similar to the head. The material they used has a very light knap, but doesn't capture the look from the show. I'm not going to knock Sideshow though for the other missing factor - watch the episode and be amused at how the suit soaks up the water from the 'storm' on the wing of the plane. I'm surprised the poor actor could even move! There are two accessories with the figure, plus the usual figure stand. The first is the best - a great piece of the wing itself, scarred from the flames and bent at odd angles. When you see it in the box, you'll see only the interior side, so the brown and black color may throw you, but fear not - it's a bright silver on the other side, which would be the exterior of the plane. There's also three small wires, which I'm assuming represent wires he pulled out of the engine. They look okay, and actually make sense, but aren't exactly the most costly accessory. The final item is the usual stand, which works fine and has the TZ emblem, along with the show name, painted on it. At $35, this one isn't quite as good a value as the Kanamit. Shopping around though should net you a better deal, and therefore a better value. The Gremlin is my least favorite of the series so far. He's not quite as nice as most of the other TZ and OL figures produced to date, and the simple matter is that most folks who haven't watched the episode in recent history will judge him based on the fact that he looks like a guy in a fat suit. True, that's exactly what he's supposed to look like, but I'm not sure enough people will realize that. Although he's my least favorite so far, he's still a well done figure, and he does look both appropriate and in place with the rest of the line. If the knap on the body suit had just matched the show a little better, I would have been much happier. - Big Bad Toy Store has them for $30 each. - Aisle Sniper has them at $33 each. SPECIAL NOTE! Right now Sideshow is selling the new Knight of Ni figure as a preorder. They will only be available through the Sideshow store, and they are only making 1000. You might want to pre-order this one if you've been picking up all the Monty Python figures!